Dividing your body in to Major Muscle Groups is a great way to build workouts and exercises. In this article you will discover the best way to do so with sample exercises and workouts. There are over 650 Skeletal Muscles in the Human body but very few qualify as Major Muscle Groups. Major Muscles are the largest muscle groups in the body and are largely responsible for all our Body movements. But although these major muscles perform the move, they are helped by many small muscles called synergists. Major muscles will mostly be the prime movers but they cannot act alone. It is best to divide your body in to 8 muscle groups rather than just Upper body and lower body muscle classification as you will later learn in the Split Training Section. I have classified arms in to Biceps and Triceps. Also leg has been divided in to Thighs and Hamstrings. Trapezius are considered by some as part of Shoulder area and some treat it as a part of Back Muscle. 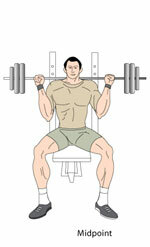 I have mentioned it separately and can be trained with either shoulders or Back Muscles. When you train these Muscle groups you will invariably train many smaller synergists muscles like rhomboids, erector spinae, brachialis, Serratus, sartorius, gracilis, intercostals and many more. 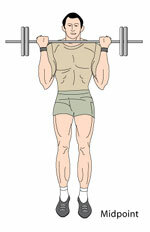 I have mentioned forearms and calves separately as many trainers do not give them the attention they deserve. Dividing them and classifying as must-train major muscles will give them the training they deserve. It is sufficient to train these muscles and you will get an amazing overall Muscular development. Now its time to learn how to divide these Muscle groups and spread them over your training routine. The famous Split Training System is discussed elsewhere. The article also discusses Whole Body Training Vs Split Routines and provides sample 2,3,4,5 and 6 day routines. Also mentioned are Double Split Routines. 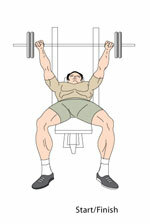 Also read Weight Training Exercises andWeight Training Workouts for more Training information.